When the New York Times and the Washington Post reported in early June 2013 that the NATO Secretary General Anders Fogh Rasmussen had discussed with President Obama the possibility of establishing a military training mission for Libya, it was one small indication of the massive breakdown of normal life that had taken place in Libya. At the end of October 2011, after the execution of Colonel Muammar Gaddafi, the same Secretary General Rasmussen had announced the end of the NATO mission, declaring that the NATO mission to Libya had been “one of the most successful in NATO history.” Despite this announcement of success (that has subsequently been echoed by mainstream academics), there are daily reports of fighting all across Libya. With over 1,700 militias roaming and killing at will in Libya, the level of insecurity is unprecedented in the history of the country. Almost every community is now held under lockdown by armed persons who follow no law other than that which will yield money and goods. Two of these strong militias, in Benghazi and Misrata, vie for dominance as the levels of violence and destruction consume political leaders, judges and senior officials. In a move that has consolidated the hold of Jihadists, the General National Congress (GNC) pushed through a “political isolation law” barring Gaddafi-era officials from government posts. Among all the Libyans in the corridor of power today the majority of those who did not serve in the Gaddafi era are extremists supported by the most conservative elements from the Gulf states – the same forces fanning the flames of instability in numerous parts of Africa. French activism in North Africa is directly related to the fear of the insurrectionary impulses that have arisen in Tunisia and Egypt. These calls for change in the political system are reverberating throughout the world with the youths of Europe calling for a change in the social system in Greece, Italy, Portugal and Spain. A successful grassroots revolution holds the promise of a people-centred and genuinely democratic government. Such a paradigm is a threat to the interests of western militarists, conservatives, and jihadist forces. Conservatives and jihadists have now joined forces in order to halt the spread of revolutionary ideas. Libya has now become one of the central bases for counter revolution in North Africa and the Middle East. As the revolutionary momentum matures in Egypt, the conservatives have planted enough instability in Eastern Libya in order to find a pretext for new and larger military interventions. The meetings at NATO’s headquarters about Libya are one indication of the planning for new deployments. Last week, on June 22, 2013 the New York Times featured a lengthy article on the flow of arms to Syria from Libya. However, the authors of this article did not outline the infrastructure of support for the Jihadists in Syria that had been established by David Petraeus when he was the head of the Central Intelligence Agency. It was this same infrastructure that took the life of the US Ambassador to Libya, Christopher Stevens. Citizens of the United States learnt of the levels of insecurity endured by the people of Libya on September 11, 2012 when Stevens was killed in Benghazi, the city that was the base of the rebellion against Gaddafi. The death of Ambassador Stevens brought out significant facts of the US diplomatic/intelligence activities and its relationship to the armed militias. The conflicting accounts of the death of the Ambassador (and three others) remain one component of the intense differences within the foreign policy establishment. While the old wing of this establishment – which wants perpetual war – is seeking to deflect attention away from Libya (and to embark on a similar plan for destruction in Syria by providing outright military support to Jihadists), Barack Obama is travelling to Africa this week in an attempt to shift the focus from militarism, by discussing trade and investments. But the planning of the US military and the military high command have control over far more resources than do the non-military aspects of US engagements. Moreover, the US Congress, which controls the purse strings, is eagerly supporting an extension of spending on the military when there are cuts in all other departments of the government. After the execution of Gaddafi on October 20, 2011 and the capture of his son, Saif al-Islam, in November, the western media went into overdrive to promote the idea that a new era of peace and reconstruction had arrived in Libya. Western citizens were assured that the country was undergoing a “transition” phase. 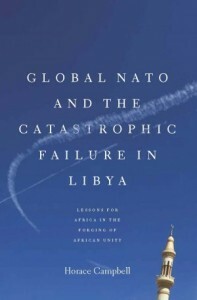 In my most recent book, Global NATO and the Catastrophic Failure in Libya, I clarified the failure of NATO efforts to control Libya and the massive killings of over 50,000 people. NATO had intervened in Libya under the banner of the Security Council Resolution of ‘Responsibility to Protect’ (R2P). But this same NATO provides no protection today from the marauding militias. Black-skinned Libyans from the town of Tawergha were expelled from their community and more than 30,000 have been displaced. Even the usual spokespersons for western imperial missions had to speak out. Human Rights Watch joined in the condemnation of the rule of the militias. Amnesty International released a report, “Rule of Law or Rule of Militias?”, bringing into sharper focus some of the outstanding questions of the role of these armed marauders all over Libya. Meanwhile, a conduit was established for organising and moving arms and fighters between Libya and Syria. Ambassador Chris Stevens, who was eliminated as a result of squabbles among the militias in Benghazi, belonged to the section of the US State Department that was very knowledgeable about the movements of militias between Benghazi, Libya, and the current war against the Assad regime in Syria. Libyan Islamists from the Eastern region comprise the largest single component of the “foreign fighters” playing an ever more dominant role in the war being waged in Syria, with the aim of toppling the government of President Assad. According to some estimates, they comprise anywhere from 1,200 to 1,500 of approximately 3,500 fighters who have been infiltrating Syria from as far away as Chechnya and Pakistan. It is now also known that Al Qaeda has established a strong footing among the Jihadists in Syria, and as reported on June 21 Spain had arrested Al Qaeda forces recruiting fighters for Jihad in Syria. In this context, US engagement with jihadist fighters – in Libya, Syria, and elsewhere – reflects the complicity of the US in creating conditions for the flourishing of terror through the folly of US global militarism. 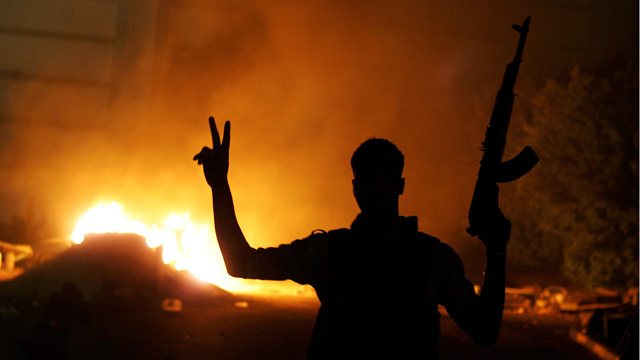 The events surrounding the death of Ambassador Stevens exposed the US role and presence in Libya at a number of levels. First, the role of Stevens exposed the hypocrisy of the so called “war on terror.” The US and its allies are supposed to be fighting a war on terror yet, at the same time, are supporting the same elements in Syria they claim to be fighting elsewhere. Second, the evidence of what has taken place in Libya since the execution of Gaddafi points to the integration between US intelligence and the local militias. The third level was the jockeying between French, British, Italian and US oil companies over political dominance in Benghazi. Traditionally, the Italians had been a force on the ground in Libya. However, during NATO operations, French, British and the US operatives muscled-out the Italians into the role of junior partners to the imperial operation. This bite is now being felt all over North Africa with the evidence of the French intervention in Mali and the deployment of US drones in Niger. However, the allies of Africa are not sitting by idly. Members of the BRICS societies have been angry over the manipulation of the Responsibility to Protect resolution. The anger of Brazil, Russia, India and China is now being turned into concrete support for the peoples of Africa and Libya. African progressives are calling out the private military contractors and intelligence operatives who are now using Libya as one of their rear bases for the war in Syria. At the recent summit of the African Union in Addis Ababa in May 2013, the new French President, François Hollande, was told clearly that the rest of the world will not sit idly by and watch French neo-colonialism in Africa. Hollande was angry but could not respond. Additionally, China has now agreed to deploy peacekeepers to Mali as another sign that the BRICS states will be more engaged in Africa. Libya remains destabilised and its citizens terrorised as NATO seeks another reason to deploy “security personnel” in their country. There are now at least seven new books that detail the quagmire created by the NATO intervention. These books from progressives have exposed the terror against the people of Libya. African peoples everywhere are mindful of how the Italian invasion of Ethiopia in 1935 heralded the start of World War II. The slow and escalating wars across North Africa and the Middle East pose great dangers to humans everywhere. Those who oppose war and militarisation must now intensify their work. Vigilance and clear political agendas are needed to oppose African dictators while strengthening the institutions of the African Union, especially the AU’s Peace and Security Council. « Previous: Analysis | Economics: towards a radical rethinking?